The arrival of the Datsun Go into the Indian car market seems to be sending the competition into a tizzy of sorts what with Hyundai said to be readying up a 1 liter-petrol engined version of its hot selling Eon hatchback. The talk of a Eon equipped with a 1 liter petrol engine is anything but new. Well, the rumour about Hyundai equipping the Eon with a 1 liter petrol engine is nearly two years old. This time around, the interesting bit is that the Eon with the larger petrol engine could be launched in the next four to six weeks. 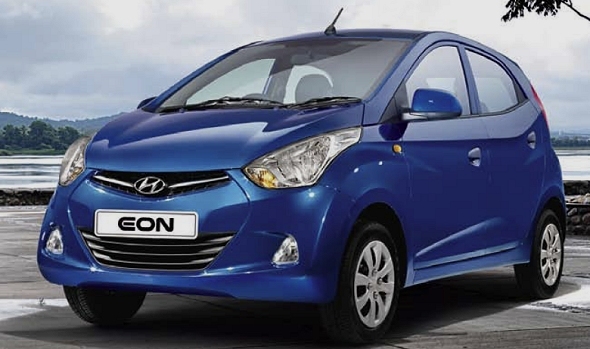 The Eon is likely to borrow the 1,086 cc-4 cylinder petrol engine that currently powers the Hyundai Santro Xing. The same engine, in a higher state of tune, also powers the i10 hatchback. Test mules of the Hyundai Eon are a regular sight in and around Sriperumbudur, the location of the Hyundai factory in India. Along with the larger engine, the Hyundai Eon could also come with a facelift as the car is nearly 3 years old in India. With competition rising, the time seems apt for a mid life makeover for the least priced Hyundai car in India. Currently, the Hyundai Eon is sold with an 814 cc, triple cylinder engine (55 Bhp-75 Nm) that is available in petrol and LPG guises. The addition of a 1 liter petrol engine (62 Bhp-96 Nm) to the Eon will not only make the car more powerful, but will also even the field given the fact that Maruti Suzuki offers the Alto K10 with a 1 liter K-Series engine and Nissan offers the Datsun Go with a 1.2 liter HR12DE engine. Also, adding this engine will give the Eon CNG capability. Currently, the Hyundai Eon sells between 2.83-3.82 lakh rupees, ex-showroom Delhi, and is available in 8 variants. Expect the larger engined variant to be priced about 30,000 rupees higher than equivalent variants featuring the 800 cc petrol engine.